Here's the third in the series of mitosis limericks (see my previous posts on prophase and metaphase). I've used these in class to highlight important events during mitosis without showing cell images. Students will see high quality images of mitosis in in their textbook. 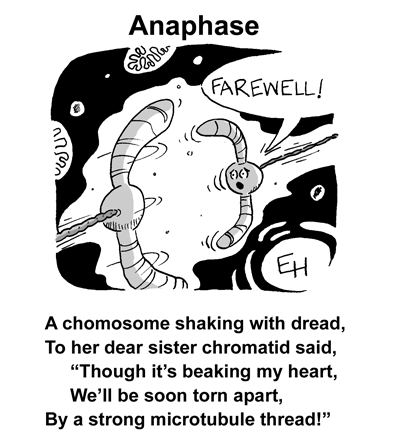 Anaphase is my favorite of these limericks...both touching and accurate from a cell biology standpoint. In this poem a single piece of DNA is referred to both as a chromosome and a sister chromatid. This is not inconsistent. Correctly identifying the number of chromosomes in a cell is challenging when considering DNA replication and cell division. In my experience, a full understanding of chromosome number has to begin with understanding what chromatids are. Above is a drawing from my lecture when I introduce this idea. I start drawing a single curly line (left) representing a single double-stranded DNA molecule. If that single piece were to condense the result would be a single chromatid (upper half of the drawing). 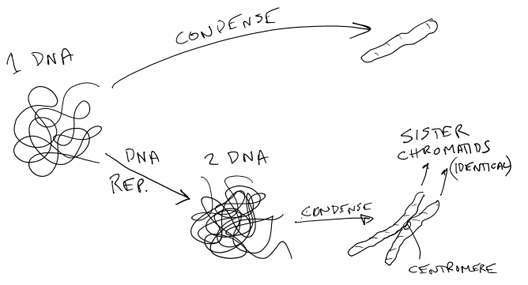 However, in the cell cycle condensation of chromosomes (in M phase) is always preceded by DNA replication (in S phase). In the lower half of this drawing I'm showing that DNA replication has produced two identical DNA molecules (shown as two curly lines). When these condense the result is sister chromatids. I try to make it very clear that the two sisters are identical copies of the same chromosome. The definitions get a bit tricky during anaphase (and telophase). During metaphase each chromosome is a pair of sisters held together at the centromere. So what do we call these structures once the centromere separates at anaphase? I've seen a few textbooks that say the chromosome number in the cell doubles in anaphase (i.e. a human cell has 46 chromosomes in metaphase and 92 in anaphase)...but I've never felt this is helpful for students trying to understand the central events of mitosis. I think it's best for students to understand that during DNA replication and mitosis the chromosome number never changes. A human cell has 46 chromosomes before DNA replication, 46 chromosomes after DNA replication and 46 chromosomes at every stage of mitosis. The resulting daughter cells also have 46 chromosomes. If my count is correct there should be one more limericks to go. I will post that soon. This is totally AWESOME. I'm going to use it in my class this week. Mitosis is always tough to understand. Thank you for this.